Since Inmotion’s inception in 2001 they have operated behind the idea of understanding business, not just e-business. They back this by offering fast, reliable web hosting solutions. Their employees average over 4 years of hosting experience each, meaning the company as a whole is extemely knowledgeable about the industry. 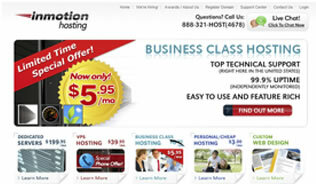 Inmotion’s virtual private hosting is widely regarded as one of the best in the industry. Although a bit pricier, customers get a lot of bang for their buck. With a host of included features, Inmotion customers will have no trouble getting the most out of a VPS account. A perfect solution for business and e-commerce websites, Inmotion offers one of the best all around packages out there. Inmotion offers 24/7 support via toll free phone, online chat, and email ticket system. They also have an extensive support section on their website. Included are video tutorials, user guides, a getting started guide, as well as a support forum and knowledge base. The wealth of information that can be accessed on their site is unmatched by any other hosting provider. Inmotion offers the industry leading cPanel control panel. With it’s snappy response and library of features it is by far and away the best control panel on the market today. No other hosting control panel can match what cPanel has to offer in the way of ease of use or responsiveness.